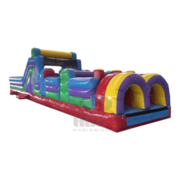 Obstacle Course rentals are the perfect choice when you have a large attendance at your event as these giant inflatables move more people through the attraction faster than any other. As much fun to watch as they are to participate, as players race through tunnels, navigate popup barriers and then make the climb to a sliding finish. Great for schools, churches and corporate events. The perfect team building activity! 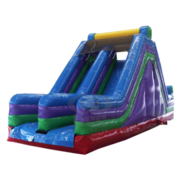 All of our inflatables are manufactured with "Lead-free" vinyl for your child's safety, and all units are cleaned and sanitized after every rental. Browse the selections below and click on the image or "More Info" to get additional details and to make a reservation.